Labour and Tory MPs pushing for a delay to Brexit or another EU referendum are showing a disloyalty to voters, former Welsh Conservative leader Andrew RT Davies has said. Theresa May has offered MPs a chance to delay Brexit for a short time if her deal cannot pass the Commons. She had been under pressure from members of her own cabinet. Mr Davies said MPs were putting "personal ambitions ahead of their responsibility to voters". 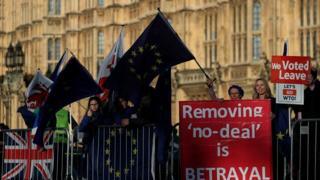 Some MPs have called for a delay to provide more time to agree a deal in the Commons, with the UK due to leave on 29 March having not ratified an agreement with the EU. The Commons endorsed the prime minister's Brexit strategy in a vote on Wednesday. On Tuesday, Mrs May told MPs the UK government would give them a series of votes in March where they would have the option of ratifying her Brexit deal, voting on leaving without a deal on 29 March or voting for a short extension to the Brexit process. The prime minister's commitment to offer MPs a delay reduced the significance of Wednesday's debate on Brexit. She had been facing pressure from her own cabinet ministers to not allow the UK to leave the EU without a deal. Mr Davies, who campaigned for a leave vote in the 2016 referendum, said the two main parties at Westminster stood on pro-Brexit manifestos in the 2017 general election. The Conservative AM for South Wales Central supports leaving the EU with a deal on 29 March. "Every MP had their instructions, now people are putting personal ambitions ahead of their responsibility to voters," Mr Davies said. He added: "I'm deeply disappointed… that so many MPs are unpicking the commitments of the 2017 general election." Mr Davies acknowledged it would be "fair to criticise the UK government for some of the decisions they've made over Brexit, but Parliament has frustrated the process and that could push us over the deadline of March 29th". Wales voted to leave the EU in the 2016 referendum. Among the amendments proposed - but not selected - for debate by House of Commons speaker John Bercow was a proposal from Plaid Cymru to delay the article 50 leaving date to 2021. Plaid Cymru called for the withdrawal deal's "transition period" to be replaced with the UK remaining in the EU while negotiations continue, and so enough time can be made available to hold a further referendum. Arfon Plaid MP Hywel Williams said: "This would stop a disastrous No Deal exit, that no one sensible wants to see, and give the Westminster Government the ability to negotiate our future relationship with the EU with the certainty of EU member status until 2021. "A People's Vote remains the logical and democratically correct thing to do. By extending article 50 we give ourselves the time and space needed for a public vote to take place, now knowing full well what Brexit means."